A line forms behind Melanie Cedargren’s sample table, which houses a variety of olive oil and balsamic vinegar flavors from her store, the Spicy Olive. Most people sample her brownies, which taste made-from-scratch but are actually baked using store-bought mix and her blood orange olive oil in place of vegetable oil. She explains that she started her business after a family trip to Italy, where she fell in love with the fresh oils with unique flavors unlike anything she’s had in this country. Seven years and three locations later, Cedargren — who is certified as both a wine and an olive oil sommelier — confidently explains her wares to the crowd at the March 8 International Women’s Day event held at 84.51’s downtown headquarters. “If you’re getting the stuff from the grocery store, you’re missing out,” she says, explaining that oils in the U.S. often sit in warehouses and lack the nutritional value that makes them famous for their health benefits. The event welcomed a group of female business owners — and the men who support them — to recognize and share the successes of local women. The women-owned businesses that signed up for this year’s event included Brewhaus Bakery Dog Treats, The Spicy Olive, Tablespoon Cooking Company, Grateful Grahams, and Lauren Pax, a yoga instructor with Define Body & Mind, along with Girls With Pearls and the Black Career Women’s Network. 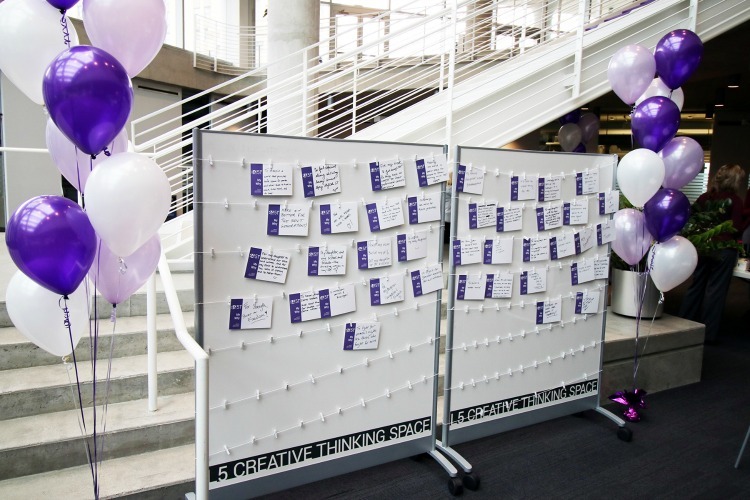 The "creative thinking space" allowed attendees to explain their "why" on International Women's Day. It’s designed to celebrate the achievements of women, and to discuss what actions can be taken moving forward for a more balanced world, which is why there were also interactive groups highlighting diversity and inclusion, along with a “creative thinking space,” where attendees could scribble their “why” on a card using a Sharpie. And this means taking steps beyond the event to support and encourage women in the workforce. This translates into a variety of workplace amenities, including five weeks of vacation — so that you don’t have to choose between taking a trip or just spending time with your family at home, Wilson explains — along with a fitness center and exercise classes (Zumba, Yoga, and strengthening, to name a few), relaxation rooms, mothers’ rooms and an on-site masseuse and physical therapist. There’s also a Women’s EDGE employee resource group — the very people, actually, who passionately helped start this event — that focuses on networking, career management, becoming an influencer, and, in general, providing employees with the resources they need to be successful. The group now has two new subcommittees — women of color and women in technology. 84.51 also co-founded a program, Power Squad, which focuses on groups of diverse women within the same company, identified as high achievers and the types of people organizations want to retain. Members of the squad take classes that help grow their leadership skills and give them additional workforce expertise. As a data science company, they saw also a need to empower women in STEM — specifically technology — and sought to find a way to better support women in these roles. In order to do this, two scientists at 84.51, Jyotsna Sharma and Meehee Kosmala, ran focus groups and learned about the various challenges surrounding women in tech, ranging from the need to receive encouragement and mentorship to common issues like feeling alone, unheard, and under-appreciated. As part of the solution, they started a people-led “Women in Tech” program that will engage community members from early childhood through their careers, publish research, and provide coaching and workshops. Additionally, during the event, 84.51 announced plans to launch a STEM Scholars Program in 2019. Initially, says Wiethorn, the scholarship will go to a high school female in the tri-state, and there are plans to expand it to African-Americans and Hispanics as well. “We thought today would be a good day to roll that out,” says Wiethorn during the event. The more than 60 members of the company’s MARC group (Men Advocating Real Change) are empowered to engage in workplace inclusion through research-based programming and an online community.